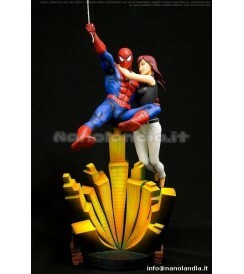 Crafted by master sculptor Junnosuke Abe, this classic rendition of Spider-Man stands almost 10 inches tall from the base of the miniature cityscape to the top of the Web Slinger's outstretched arm. As with every Fine Art Statue in the Kotobukiya Collection, Spidey is constructed of high-quality cold cast porcelain and is a limited, numbered edition. This statue is a Limited Edition Size of TBA Pieces Produced Worldwide.